‘Wing Commander Anderson has been in command of No. 268 Squadron since December 1940. At the time the Squadron was equipped with Lysanders and in order to get some sort of operations for his pilots he arranged for dusk and dawn patrols off the East Coast. In May 1941 the Squadron was re-equipped with Tomahawk aircraft and by September was fitted with a No. 19 A.F. wireless set giving larger range. On 19 October 1941, the first attack was made on targets at Ijmuiden and Dan Helder in Holland with the Wing Commander leading. Several other attempts were made by Wing Commander Anderson but were abandoned owing to lack of cloud cover or fog. In December, in order to get further operational experience, Wing Commander Anderson asked for and obtained permission to be attached to R.A.F. Ibsley with a view to getting combat experience. Working under 10 Group, Wing Commander Anderson and three pilots carried out convoy patrols. In January 1942, owing to the numerous mechanical failures of the Alison Engine, H.Q., Army Command, stopped operational flying. Throughout the above period the Squadron continued its normal role of training with H.Q. No. 2 Corps. In April 1942, the Squadron was re-equipped with Mustang aircraft and in June, at the request of Wing Commander Anderson, it was permitted to carry out shipping reconnaissance off the Dutch Coast. In August 1942, the Squadron was attached to No. 12 (Fighter) Group for full fighter operations and was equipped with V.H.F. and operated on interceptor patrols, shipping reconnaissance off the Dutch Coast and attack of ground targets in Holland and Germany. It has been due to the personal effort of Wing Commander Anderson that his squadron has been enabled to carry out offensive operations and he himself has always led the first of any new type of sortie. In October, Wing Commander Anderson led a section of four Mustangs to North-West Germany and attacked targets on the Dortmund-Ems Canal. This was the first time that single-engined fighters based in England had attacked targets in Germany. Throughout this period, Wing Commander Anderson has led: 6 Tomahawk operations over Holland; 2 Mustang “Rhubarbs” – one over Holland and the other over Germany; 12 Mustang shipping reconnaissance operations; and 3 Mustang interceptor patrols over the North Sea. 1 1000-ton ship destroyed (seen on fire); 2 1000-ton ships severely damaged (one on fire); 1 minelayer damaged; 1 tug destroyed; 3 tugs damaged (one on fire); 3 barges severely damaged; 1 500-ton ship and sundry small M.Vs damaged; 1 ferry damaged; 2 M.T. destroyed; 1 Met and 1 A.F.V. damaged. These attacks were carried out often in the face of intense accurate flak and twice Group Captain Anderson’s aircraft was hit and damaged. Since the date of his last award this officer has carried out 49 sorties over enemy territory, some of which were to provide photographs necessary during the planning of “Overlord”. Besides the claims made above, he has scored successes against a number of different types of target including 16 locos damaged, parties of troops on the ground, and damage to transport vehicles of all descriptions, at all times displaying a fine offensive spirit and courage of a high order. Alan Ford Anderson was born in Simla in November 1910, the son of an Indian Army officer. Educated at Winchester and the R.M.A. Woolwich, he was commissioned as a 2nd Lieutenant in the Royal Artillery in January 1931, but transferred to the Royal Warwickshire Regiment later in the same year. 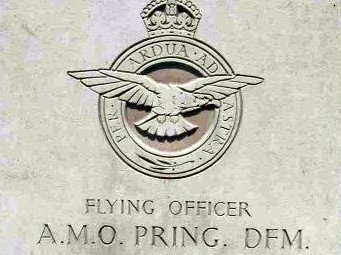 Ambitious to fly, however, and following time in Egypt, he obtained a welcome secondment to the Royal Air Force in early 1934. Having then qualified for his “Wings”, he was posted to No. 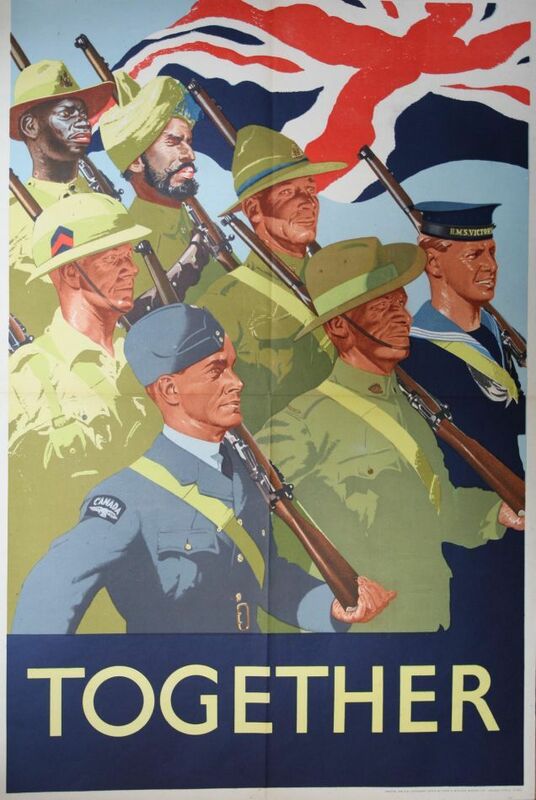 13 (Army Co-operation) Squadron and, after a brief period back on regimental duty in 1938, to another Army Co-operation unit, No. 2 Squadron, in the rank of Flight Lieutenant. No. 613 Squadron 1940 – off to war in a biplane – D.F.C. Shortly after the outbreak of hostilities, and having been briefly employed at Abbeville, he was granted the temporary rank of Squadron Leader and appointed to the command of another Army Co-operation unit, No. 613 (City of Manchester) Squadron, then equipped with obsolete Hectors, but gradually taking delivery of Lysanders, and in early 1940 he volunteered to ferry a Lysander to Finland for operations against the Russians – a journey entailing civilian clothing, a false passport and, as it transpired, a forced landing in Norway. (a) The bombs didn’t fit the racks, and were free to swing longitudinally as well as vertically, just enough to cause hang-ups or premature release (taxi-ing or in bumps). (b) The nose pistols often unwound in the airflow, arming the bomb on the rack and exposing the detonator during take-off or in the air. (c) The pilot’s manual release gear, always awkward to operate, was, with differently designed bombs, liable to fail. ‘At 04.10 613 Squadron took off for Hawkinge. We were briefed to drop supplies of ammunition and water to the Calais garrison in two simultaneous missions – (a) by the Lysanders of the Air Component Squadrons on the Citadel and (b) by 613 Squadron Lysanders on the Docks area, where part of the garrison was now isolated. This force was to be supported by low-level bombing and low flying attacks by the Hectors of 613 Squadron. A section of Defiants was to provide top cover for the Citadel force. At 09.50 we took off through traces of lifting ground fog. The landfall was clearly marked by black smoke stretching about 120 degrees across the horizon from Dunkirk to Bologna. The weather over the Channel and France was sunny with unlimited visibility. With the Lysander Flight to starboard in echelon, I led the Hectors into the target in a shallow Vic, diving from 4,000 ft. We dropped our 120lb. bombs at about 600 ft. on the run in, and shot up such targets as we saw, mostly L.A.A. gun posts and a few trucks. We got a certain amount of light flak, and some Bofors fire from the dock area, and turning half a mile inland we came back at ground level to give the air gunners a chance to find targets and to create what diversion we could for the Lysanders. The smoke was fairly thick near the ground, and I lost sight of the Lysanders as we went in. Anderson was awarded the D.F.C. No. 268 Squadron 1940-42 – Tomahawks and Mustangs – D.S.O. In December 1940, Anderson was appointed to the command of No. 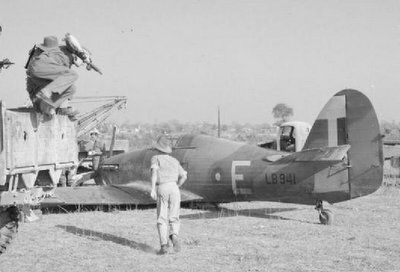 268 Squadron, equipped with Lysanders, but shortly to convert to Tomahawks, an unhappy transition owing to the many defects in the latter aircraft’s performance – in fact according to Anderson ‘the worst aircraft in the world’: nonetheless, operational work was keenly pursued and, in October 1941, a notable attack carried out against targets in Ijmuiden and Dan Helder in Holland. Having been re-equipped with Mustangs in April 1942, No. 268 embarked upon a spate of interceptor patrols and shipping reconnaissances off the Dutch Coast, in addition to attacking ground targets and, from August of that year, on attachment to No. 12 (Fighter) Group, commenced full time fighter operations, the recently promoted Anderson – now a Wing Commander – invariably taking the lead. Thus in October, he led a section of four Mustangs to North-West Germany in October, the first time that single-engined fighters based in England had attacked the Nazi homeland in daylight, on this occasion causing extensive damage to targets on the Dortmund-Ems Canal. For ‘his magnificent leadership, courage and example’, he was awarded the D.S.O. Wing Leader – No. 35 Wing 1944-45 – Bar to D.S.O. Grounded at the end of 1942, Anderson attended the R.A.F. Staff College, but in the summer of 1943, after being appointed Wing Commander (Operations), H.Q. No. 35 Wing, he orchestrated his return to operations, taking part in a flurry of interceptor and anti-shipping patrols, in Mustangs operating out of Odiham and Tangmere. In March 1944, Anderson was advanced to the acting rank of Group Captain and joined the Planning Staff for D-Day, but he was back in action with No. 35 Wing, comprising 2, 4 and 268 Squadrons, as part of 2nd T.A.F., shortly thereafter, and particularly in the above cited period of December 1944 to February 1945, when the Wing operated out of airfields at Ghent and Gilze Rijen – thus a mass of damage inflicted on enemy transport, armour and troops, and indeed enemy shipping. For his own part, Anderson’s ‘courage of a high order’ resulted in the award of a Bar to his D.S.O., in addition to being appointed a Commander of the Order of Orange-Nassau; see Coming into Land, by Bill Malins, D.F.C., for some good accounts of 268 Squadron and 35 Wing in action, in which he describes Anderson as ‘the very best C.O.’, who led by example. No sooner had hostilities ended than Anderson found himself “flying a desk” at the Air Ministry, dealing with accident prevention, so he was relieved to return to duty as C.O. of No. 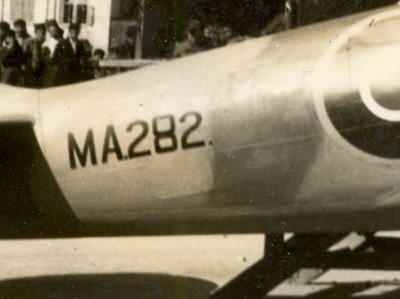 324 Wing in Egypt, flying Tempests, in 1948-49, a period that witnessed him making a wheels-up forced-landing in February 1949. A staff appointment at S.H.A.P.E. in Paris having followed, he returned to the U.K. and became C.O. of Western Sector, Fighter Command, in which period he flew Meteors. Taking his retirement as a Group Captain in 1958, Anderson took over the Channel House Hotel at Minehead and, after seven years as a hotelier, opted for growing tomatoes commercially in Somerset. Retiring for a second time, to Minorca, he returned to the U.K. after 20 years, where he died in December 2002, aged 92. (i) The recipient’s original R.A.F. Pilot’s Flying Log Books (5), comprising Form 414-types, covering the periods January 1934 to July 1936, August 1936 to December 1939, and January 1940 to December 1944; and Form 1767-types covering the periods January 1945 to November 1951, and December 1951 until September 1957, the wartime period examples with a quantity of inserted newspaper features and, by the time of his command of No. 35 Wing, particularly detailed operational entries: a fine record reflecting participation in nearly 100 sorties, many of them of the low-level kind. (ii) Three congratulatory letters on the award of his D.F.C., two of them from senior officers at No. 22 Group and all dated in November 1940. (iii) Official correspondence, warrant and statutes for the Order of Orange-Nassau, 1947-48, including investiture letter. (iv) A wartime photograph album (approximately 140 images), ranging from operational scenes with No. 35 Wing in 1944 through to Berlin and Hamburg in early 1946, with good coverage of fellow pilots and aircraft. (v) Another wartime photograph album (approximately 70 images), ranging from R.A.F. Hurn in the summer of 1942 through to June 1945, as kept by the recipient’s second wife, and again with good coverage of pilots and aircraft. (vi) A further selection of wartime photographs (approximately 50 images), including targets under fire, a visit by the King and Montgomery to a forward airfield in Belgium, and further aircraft and personnel; together with a selection of post-war images, including time in Meteors, some official messages and letters relating to his time in Egypt in the late 1940s, and an official programme and related luncheon menu for the Queen’s visit to R.A.F. Leuchars, June 1957. (vii) Official Grant of Squadron Badge for No. 268 Squadron, hand-illuminated badge and motto, as painted by an artist of the College of Arms, dated November 1941, and signed by the Chester Herald and Inspector of Royal Air Force Badges, J. Heaton-Armstrong, and H.M. King George VI, creasing and tear to top of document. (viii) Official Air Ministry letter with record of service, together with 9pp. career summary written by the recipient. (ix) A file of correspondence with Airey Neave, the much decorated Colditz escaper and author of The Flames of Calais, including the recipient’s part hand written and carbon copy accounts of 613 Squadron’s part in the operations of May 1940; together with other miscellaneous official reports and paperwork.